NetFirms is not the cheapest or fastest website hosting service. They have however, proven to be reliable. We especially like their fast and easy to use 24×7 e-mail, chat and phone support. Through years of experience with the company, we have found their knowledgeable support personnel to be amongst the best in the business. In our opinion, NetFirms is not a company to follow the crowd — or in certain cases — best practices. We had issues with their pricing disclosure policies and checkout process. We found NetFirms to be something of a mixed bag. On balance, NetFirms has earned 4 stars and the NCM Online designation of RECOMMENDED WITH RESERVATIONS. With more than one million customers worldwide, NetFirms is a leading domain registrar and hosting provider. Their three shared hosting packages are moderately priced and feature unlimited disk space, unlimited bandwidth, unlimited websites, and unlimited e-mail accounts. Shared plans also include one or more free domain names, vDeck 4 control panel, Simple Scripts installer, and clustered hosted technology for increased uptime during traffic spikes. All three plans are backed by NetFirms’ expert 24×7 phone, chat and e-mail support, and a 30-day money-back guarantee. For the HTML-challenged, shared plans include the Weebly Drag and Drop Site Builder, as well as Ready-to-go Websites™ (business and personal website templates interface). NetFirms also provides an extensive array of content management systems. These include: WordPress, Joomla, Drupal, b2evolution, Croogo, Textpattern, Geeklog, Anchor CMS, PHP-Nuke, ocPortal, MODx, and others. NetFirms’ lowest cost plan is called Plus. It includes the features listed above, 1 free domain name, and is only limited by the number of MySQL 5+ databases (5) and FTP accounts (50). The introductory price is heavily discounted, while the annual plan renews for $9.49 per month. For slightly more, the Advantage plan includes the Plus plan’s features as well as 2 free domain names, 200 MySQL 5+ databases, and up to 100 FTP accounts. The annual plan renews for $9.95 per month. The ecommerce-ready Business plan is the highest priced of the three and includes all of the Advantage plan’s features as well as 5 free domain names, unlimited MySQL 5+ databases, unlimited FTP accounts, priority support, SSL certificate, and dedicated IP address. It also adds ShopSite, the easy-to-use online store management system. The annual plan renews for $14.95 per month. In addition to shared Linux web hosting plans, NetFirms offers three moderately priced VPS (virtual private server) plans. All include unrestricted root access. NetFirms vDeck 4 control panel. Click to enlarge. For review and testing purposes, we purchased the shared Plus plan. The NetFirms checkout process is quick and easy. However, it is not quite transparent. While nearly all website hosting companies offer discounted introductory prices immediately followed by an asterisk, we believe that best practices dictate that the offer term (1-year plan, 2-year plan, etc.) and renewal price be posted on the same page. NetFirms includes two single asterisks on their discounted offer. The first indicates that the regular price for the plan is $8.49 per month, while the second follows the words, “Special Introductory Offer.” Following the asterisk near the bottom of the page are the words, “Promotional price is for the first term only. Plans renew at the regular rate” with a link to another page where the plan term and price can be determined. There we find that the $8.49 price applies only to 24-month plans (2-years paid in advance). The annual plan cost (which we use to compare hosting prices) is $9.49 per month. We believe that using two single asterisks — but not including the plan term and renewal price on the same page as the offer — is somewhat misleading. While you can select the 1-, 2-, or 3-year plan with its corresponding price within the shopping cart, the renewal (recurring) price is not displayed during the checkout process. Further, the shopping cart automatically adds two optional items to the total cost: automated site back up at “$12.95 per year (billed for 2 years)” and “Advanced Site Protection and Performance Accelerator” at $14.95 for 1 year. We fully understand that upsells (optional items displayed during checkout) are a standard part of most ecommerce businesses. However, those items should not be included in any total unless the customer actively selects them. While you are free to remove the two items from the shopping cart by “unchecking” the corresponding selection boxes, those boxes should have never been “checked” to begin with. 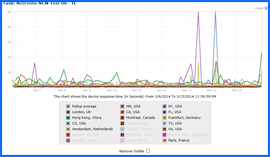 NetFirms Uptime Test Results Chart. Click to enlarge. We unchecked the two boxes, selected the PayPal payment option and submitted our order without further incident. We were pleased to see that the “welcome” e-mail provided everything we needed to set up our test site quickly including the nameserver and FTP information. NetFirms shared plans include the vDeck control panel (screenshot above right). 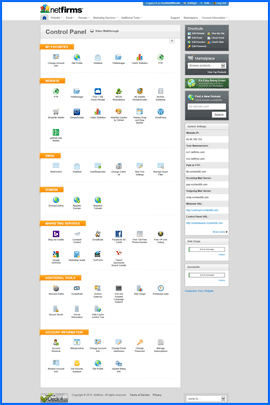 While not as popular as cPanel, it is quite similar and we found it to be just as easy to use. The MOJO Marketplace Simple Scripts interface, used to install scripts and applications like WordPress, was not difficult to use, but it is slow and includes advertising. We found it inferior to both the Softaculous and Fantastico Deluxe 1-click script installers. As it is not a WordPress site, our 1-pageNCM Test Site up and running in short order. NetFirms Speed Test Results Chart. Click to enlarge. A long-time customer of NetFirms, we were not surprised by the 10-day test results. As expected, our test site produced a perfect reliability record (screenshot above right). However, site speed was decidedly average when compared to other shared hosting providers (screenshot right). All web hosting services reviewed by NCM Online are purchased and subjected to our 10-day test for uptime and speed. NetFirms recorded an average speed of 1.5683 seconds to load our single-page test site from 13 locations worldwide, and 1.5201 seconds from 7 U.S. locations. Tested for uptime every 15 minutes over 10 days, NetFirms produced a perfect 100% reliability score. While we certainly have differences with a few of their practices, NetFirms is a reliable, fully-featured and moderately-priced shared hosting provider with first-rate technical support. NetFirms has earned 4 stars and is recommended with reservations by NCM Online. Cheap website hosting company price comparisons based on 1-year term list price before coupon/promo codes or limited time/introductory offer discounts. These are the renewal rates for the second year of hosting. To ensure that you receive the most affordable NetFirms pricing possible, please visit our Web Hosting Coupon Codes page for current discounts and special offers before making any purchases. NetFirms is one of the leading web hosting providers in the world with clients ranging from individuals to medium-sized companies. The company was founded in 1998 and has grown consistently over the years. Now it has the distinction of hosting over 1.2 million websites using some of the most advanced technologies available today. NetFirms is keen on advancing innovative solutions that can benefit its clients. Its efforts have led to the development of Clustered Hosting which the company is providing as a standard feature. The firm has also come up with its own Control Panel that was designed to streamline tasks and make web management a breeze. In-house AJAX programmers made sure that this Control Panel would be much faster and more intuitive than current solutions. All of the hosting features and management functions are easily accessible from the screen. Everything a client would need is provided quickly to enhance user experience. Recently, NetFirms unveiled a new version of the control panel that pushes the design to new heights. The company compiled comments and suggestions from clients then made the appropriate changes to address them. The result is a more responsive management console. Customers can rely on NetFirms Tier 1 Data Centers. These are run using the most stringent security procedures to prevent breaches and ensure data integrity. They are also highly scalable to meet the needs of the most demanding situations. Data centers are notorious for their massive energy consumption. Knowing this, the company has instituted measures that would allow them to reduce power utilization and environmental impact. One of these is the use of highly efficient Direct Current which has resulted in substantial power savings. 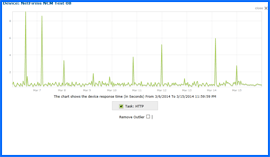 Finally, NetFirms employs Clustered Hosting for load balancing to reduce the risk of downtimes. With this technology, multiple servers share the burden so if one of them fails, the others can quickly step in and keep things running smoothly. This makes NetFirms highly resistant to denial of service attacks, malicious scripts, account overloading, and other common issues. The dynamic nature of Clustered Hosting allows it to deal with sudden peaks and makes the system much more stable. This video tutorial demonstrates the installation of WordPress on a NetFirms shared hosting account using the vDeck control panel and the MOJO Marketplace script installer.